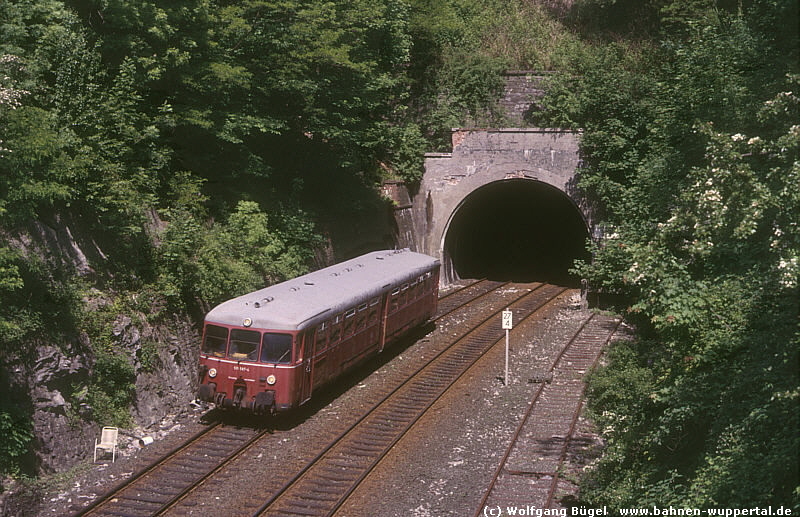 On the route of the popular Nordbahntrasse of Wuppertal you can find one special Tunnel, the Tanztunnel. 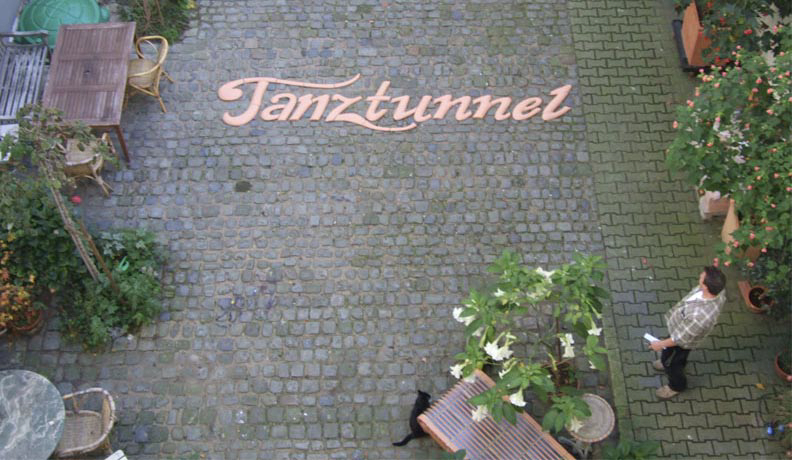 This means dance tunnel in german. 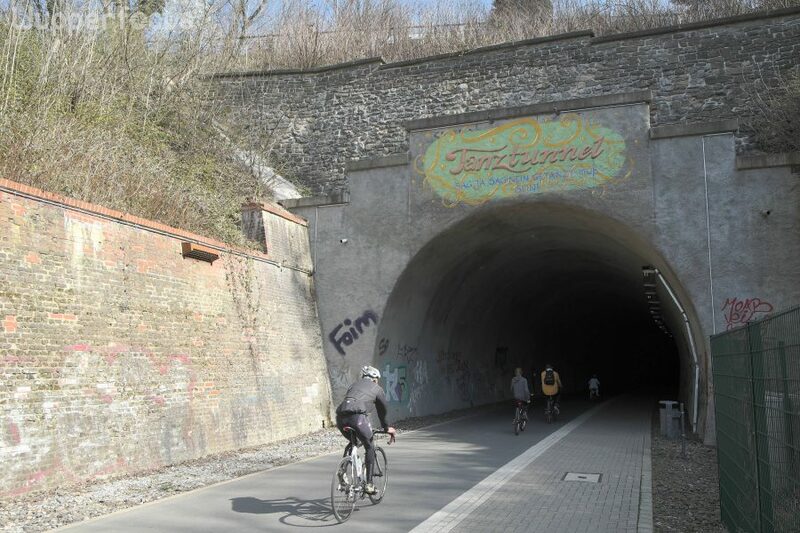 Some locals know it also as “Dorrenberger Tunnel”. Why change the name of the tunnel? The most of the cyclist, skater und walker don’t know the answer. Thats the reason I like to tell the story of the Tanztunnel. Diesen Artikel gibt es auch in deutsch. These red railcars were typical for the “Rheinische Bahnstrecke” and many other railway lines at this time. The nickname of this kind of railcars is “Teckel”. Because they don’t drive very smoothly. It is more shaky, like a dachshund or a teckel. 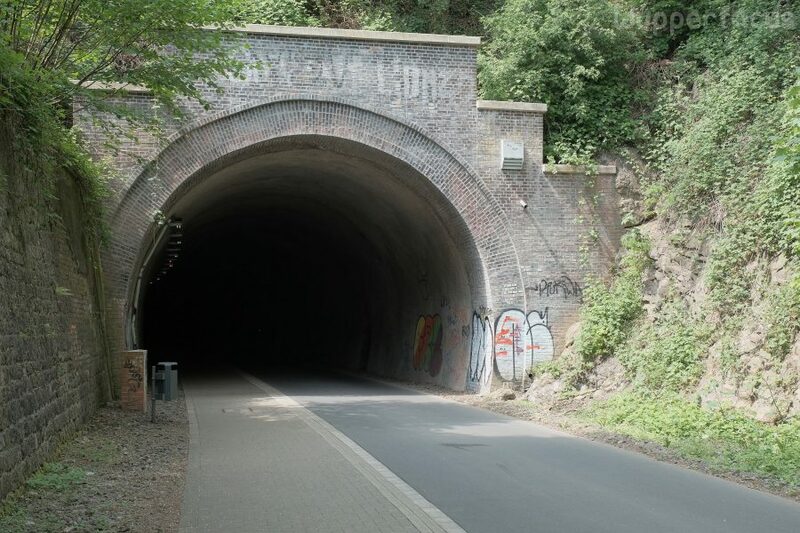 The “Dorrenberger Tunnel” closed 1999, because the Railway Company “Deutsche Bundesbahn”(DB) finished the railway operation. 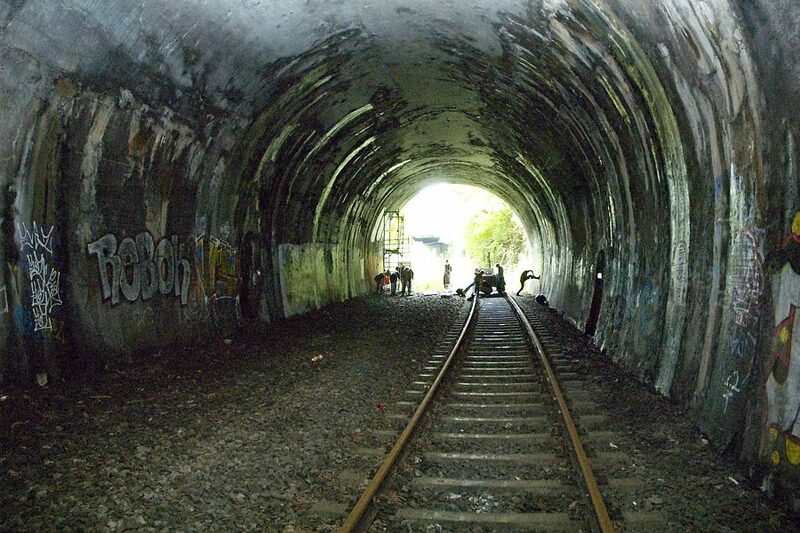 It seemed, nobody interested the destiny of the railway line. The “Rheinische Bahnstrecke” was at this time: illegal dump site, party terrain for young people and interesting area for some photographers. 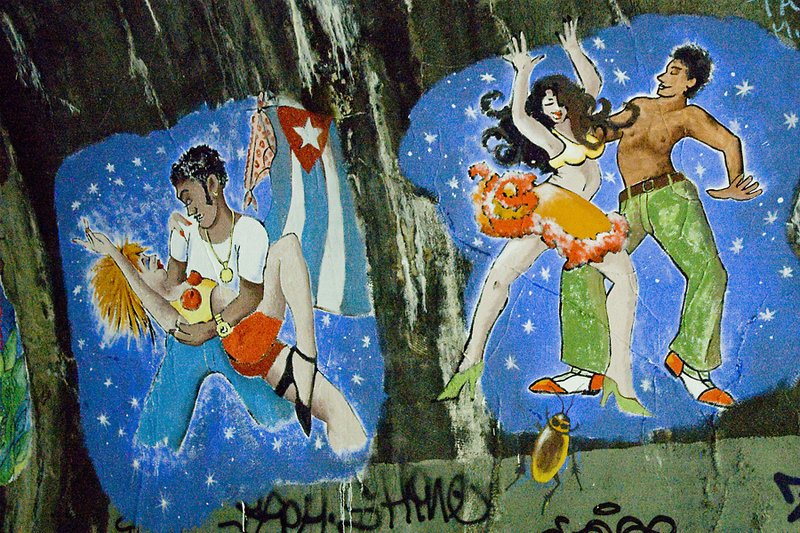 In the meantime, the old tunnel were quite popular for parties. Most of these privat events have been organized by young people. 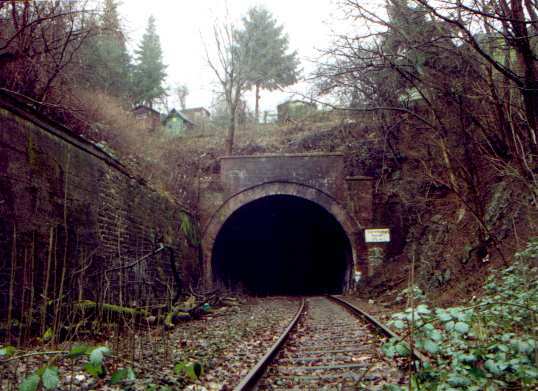 The tunnels were mostly away from residential areas. 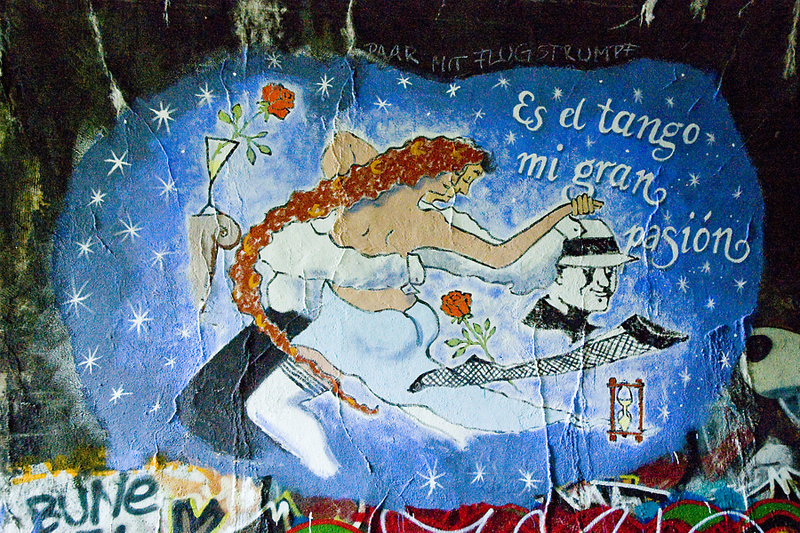 Wuppertal is also well known as a tango stronghold in europe. 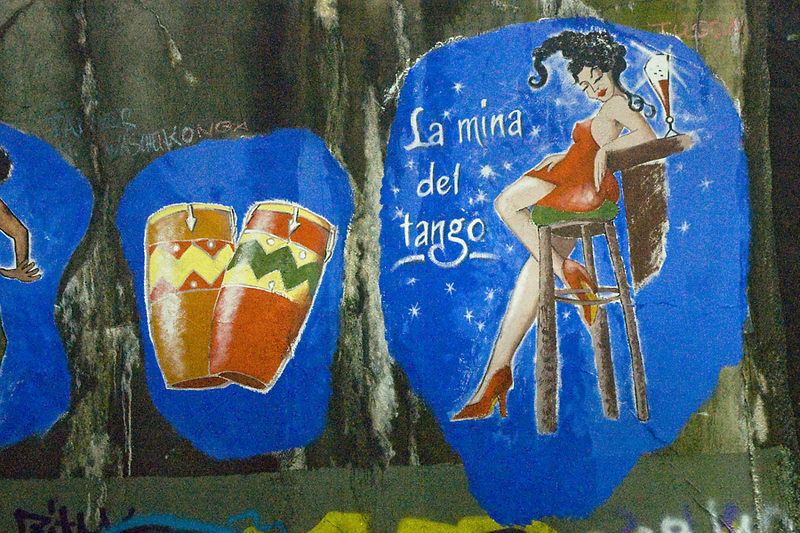 You can meet dancers in many dance schools, in “Cafe Tango”, in” Café Ada” etc.. Once a year the “Ball Tango Argentino” of the “Historische Stadthalle” in Wuppertal is one of largest and most popular dance evenings of its kind in Europe. It is in the fantastic atmosphere of the great ballroom and other rooms. The Dorrenberg is is not far away. Dajana Meier had the idea of an open-air dance area. The “Dorrenberger Tunnel” seemed ideal for it. The “Wuppertal-Katernberg” junction(A46) is nearby. 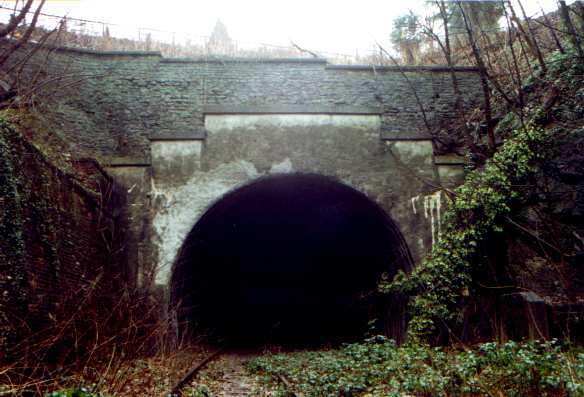 The place in front of the tunnel is near the street Briller Straße in a dell. 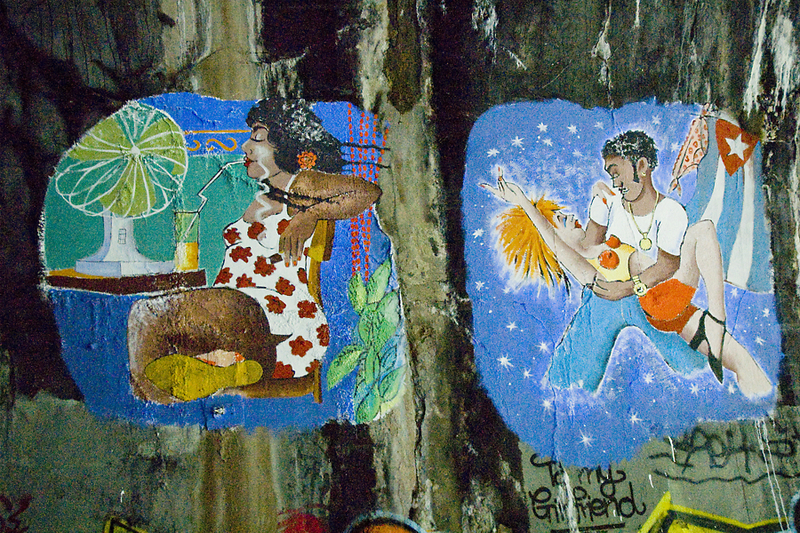 A good place for a open-air dance area, inclusive a dry place in a tunnel, when it will rain. Parking space is in and near the street Briller Strasse. And it is possible to rent toilet wagons. The initiator Dajana Meier was also an active member of the Wuppertalbewegung at this time. It was a fact: the Nordbahntrasse will be cleaned and asphalting. 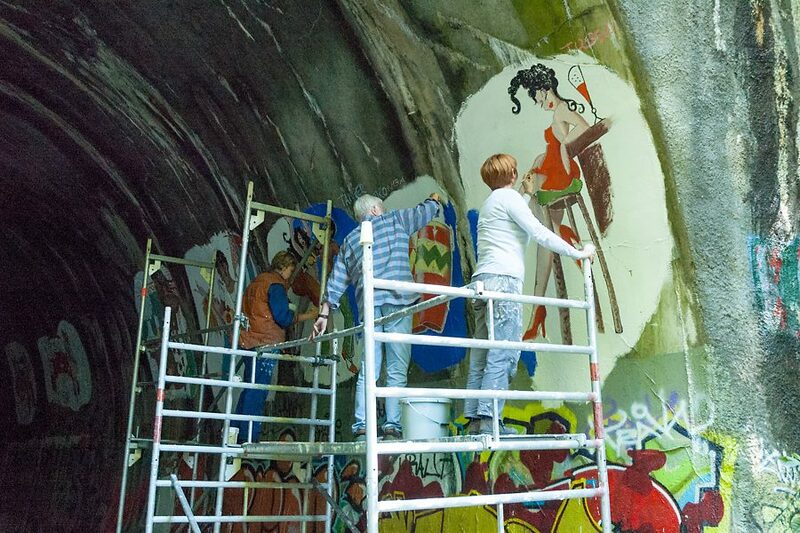 No problem for building a dance area in front of the west portal of Dorrenberger Tunnel. 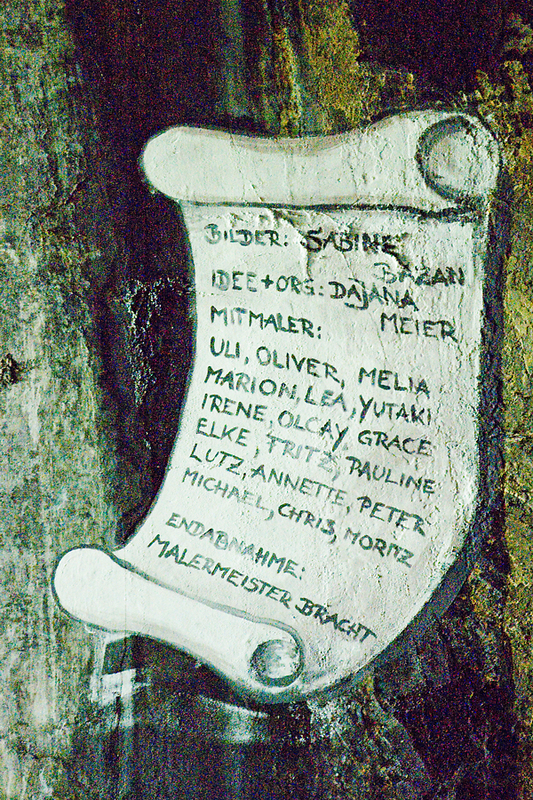 Dajana Meier organized the work in the tunnel. 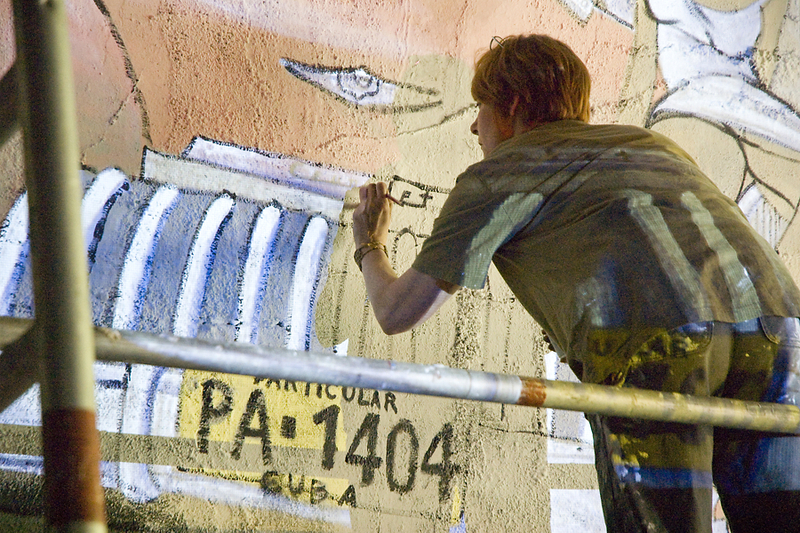 The artist Sabine Bazan took over the artistic direction. 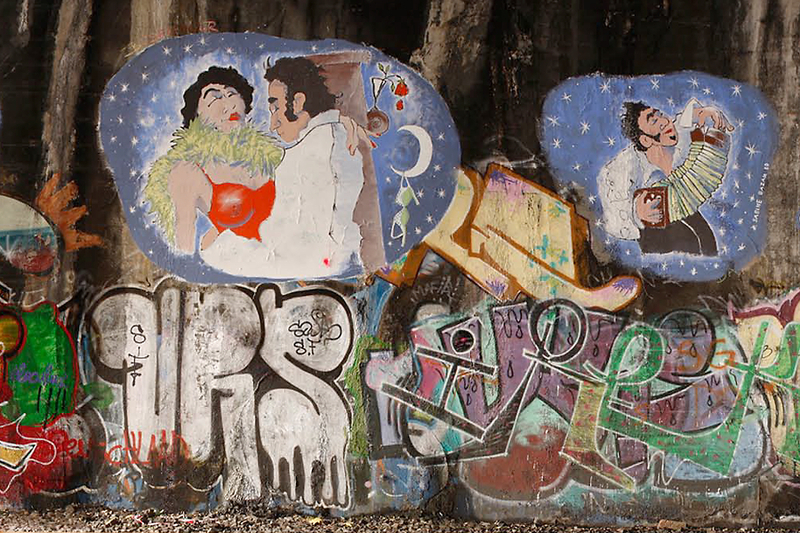 As a painter and a graphic artist she have worked with the topic dance for many years. 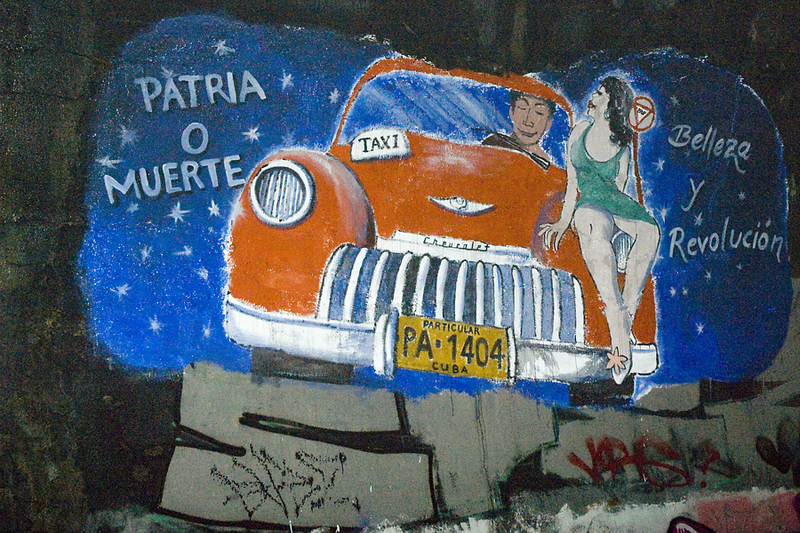 Her “Cubanisches fresco 2003” was a pattern for the painting in the Tanztunnel. 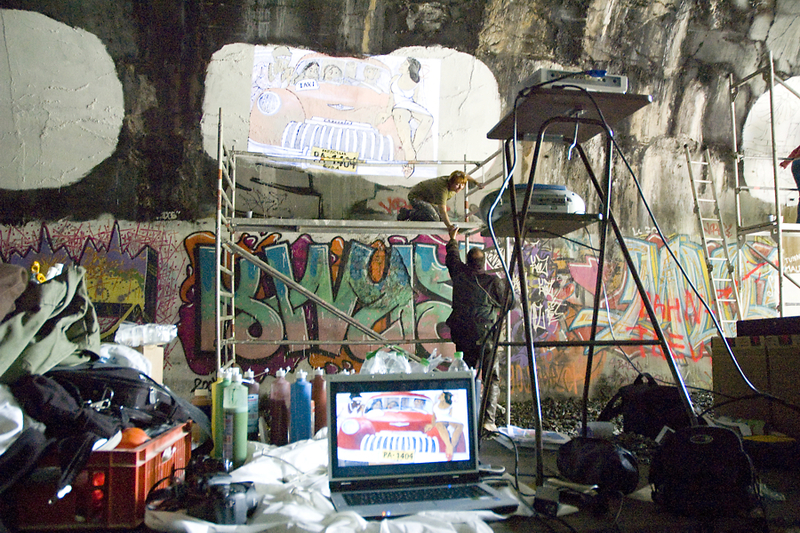 The plan wasn’t a complete painting of the tunnel(175m! 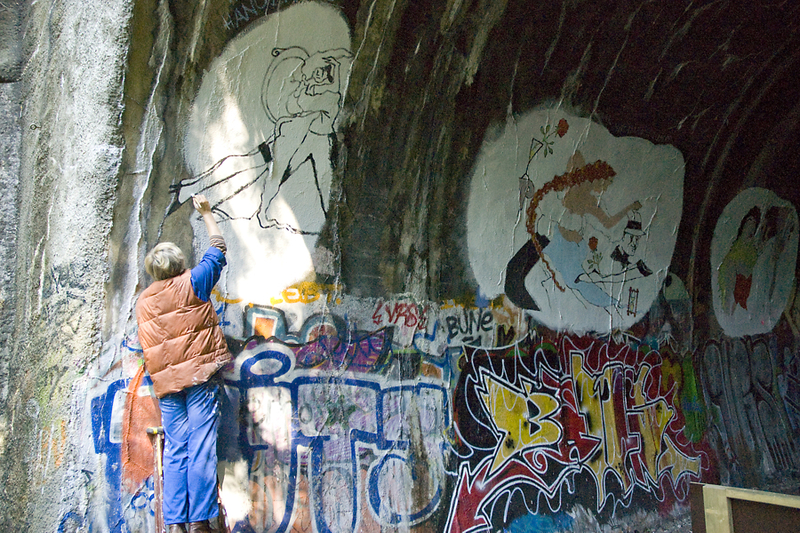 ), only the western part about 15-20 m. She planed to paint at a height of 3,5-4m. 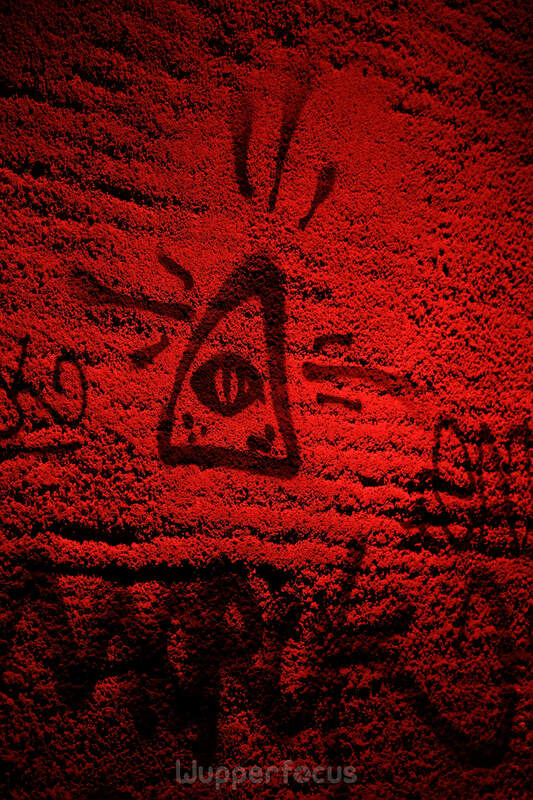 Because its look better and its more protected against graffiti. Ulla Pomian, project manager of the District Social Services in Wuppertal, had heard about the project. She asked Dajana Meier, to realize the projekt with a couple of people. 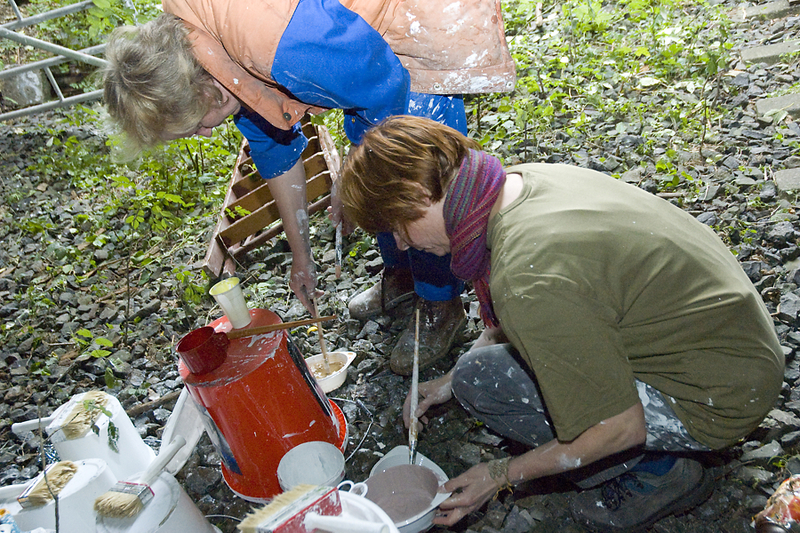 The initiator Dajana Meier and the the artistic director Sabine Bazan realized this participatory project in the time of 6.9.-14.9.2008. 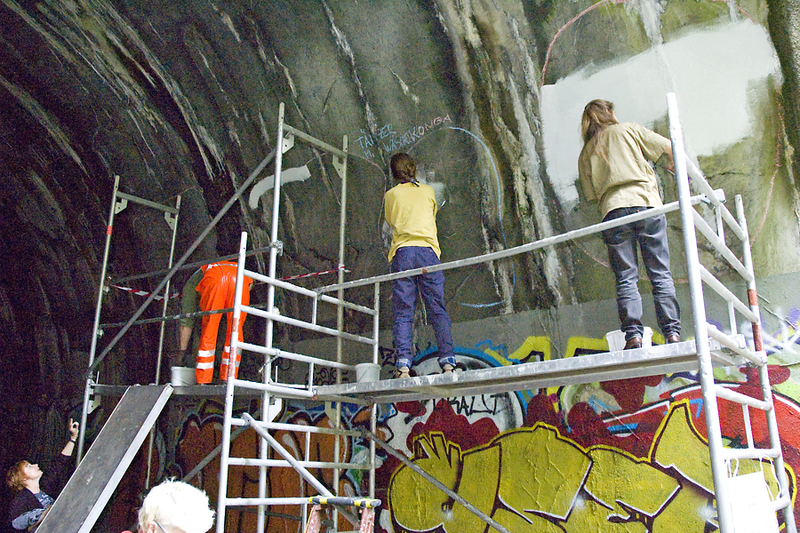 Thank you very much to Zara Zoë Gayk for the photos of the working in the tanztunnel and the finished works. A suitable lettering was missed on the west portal of the tunnel. Fall/winter 2008 the initiator Dajana Meier produced it in her own ceramic workshop. 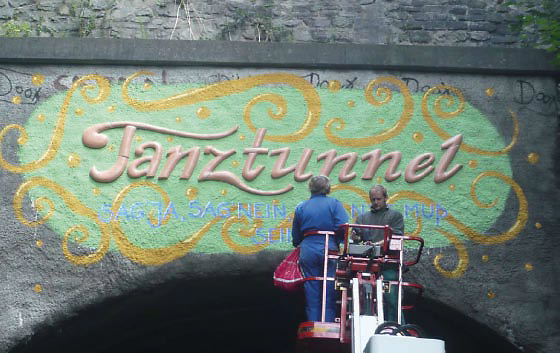 The word “Tanztunnel” is a construction of many pieces. May 2009 the lettering was installed on the west portal with a hydraladder. 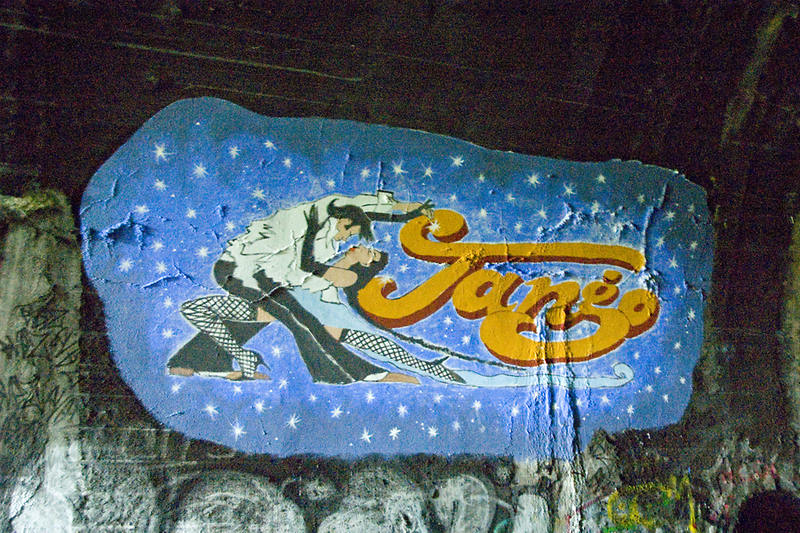 The subtitle “Sag ja, sag nein, getanzt muß sein” means “Say yes, say no, dancing must be”. This is the motto of the Füssener Totentanz. 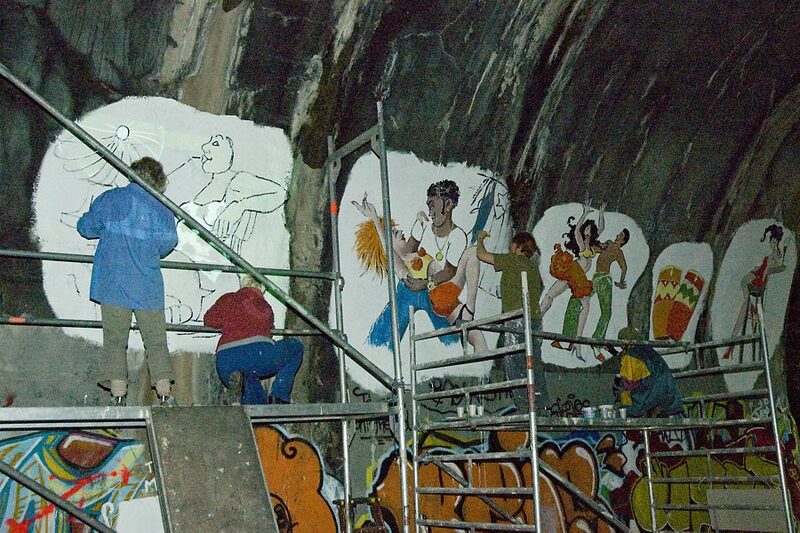 The painting of the Tanztunnel should be only the beginning. The removing of all rails and the asphalting was only a question of time. As I already wrote, Dajana Meier was also an active member of the Wuppertalbewegung at this time. She was already planing for the lighting of the Tanztunnel. 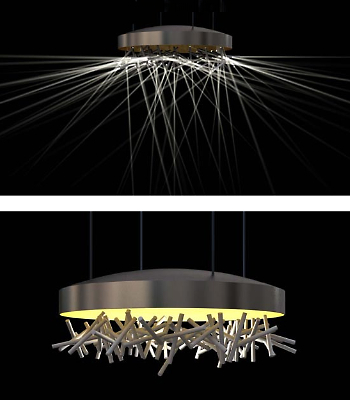 Dajana Meier developed a LED Lighting for the Nordbahntrasse and designed for the Tanztunnel specific chandelier, stable and fragile. During her project “LED Lighting”, Dajana Meier establishing a power supply for a tunnel lighting. 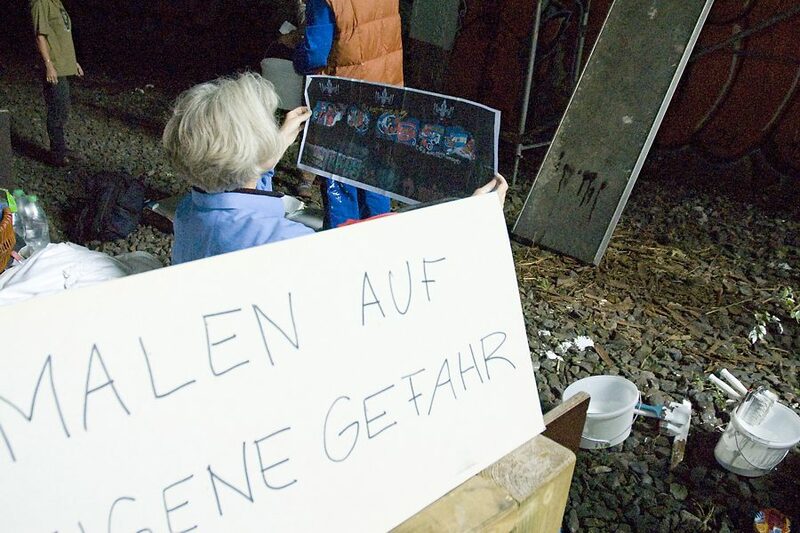 But her plan ended up in the “drawer” – like the other ideas for the Tanztunnel. At least, Dajana Meier is glad to have helped to set red lighting accents. 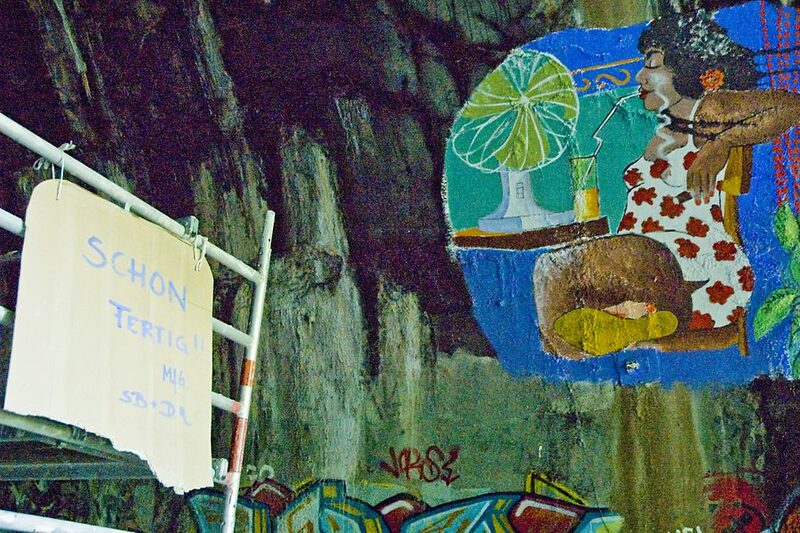 From 2012 to 2014 the Wuppertalbewegung renovate all the tunnel of the Nordbahntrasse with shotcrete. This was the dead for all paintings of the artist Sabine Bazan. 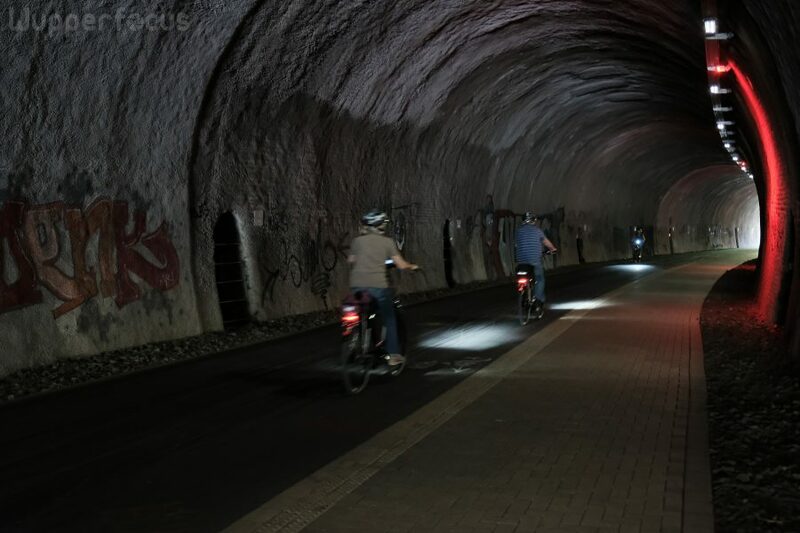 Now the Dorrenberger Tunnel is like the other tunnels. Only the lettering remained on the west portal. 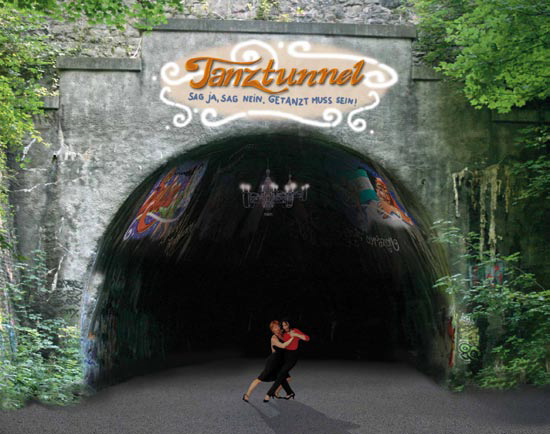 And the name “Tanztunnel”. The most of the people don’t know anything about the history. 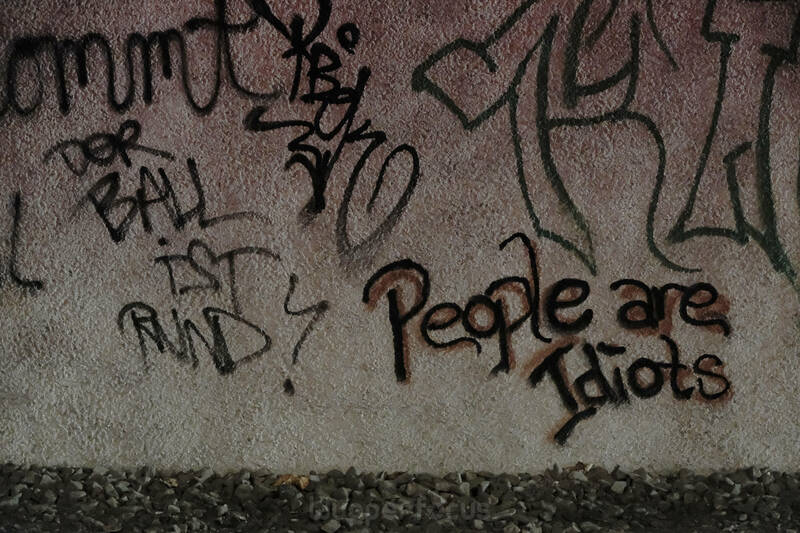 My conclusion: What a pity! 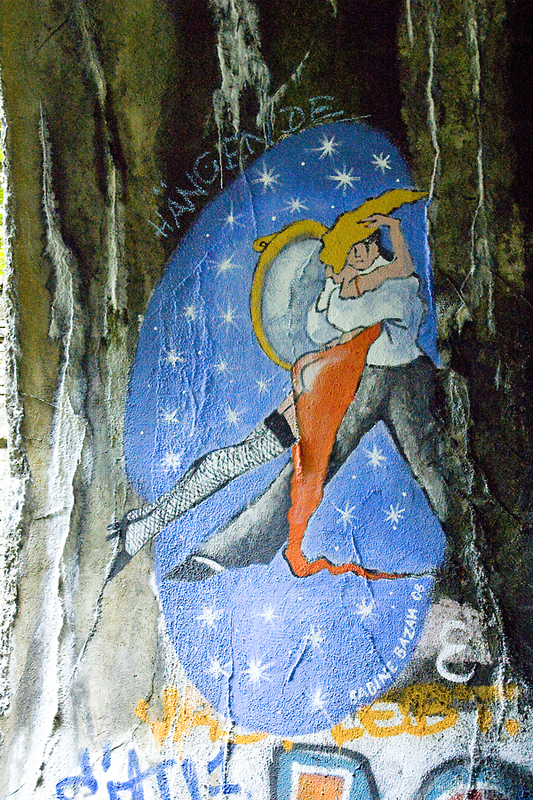 I was fascinated from the paintings of the Tanztunnel . They made the tunnel unique. It could had become a point of interest in Wuppertal. It is sad that the renovation with shotcrete destroyed this project. Was it really necessary? I don’t know it, because I am not a expert. Dajana Meier is no longer a member of the Wuppertalbewegung. 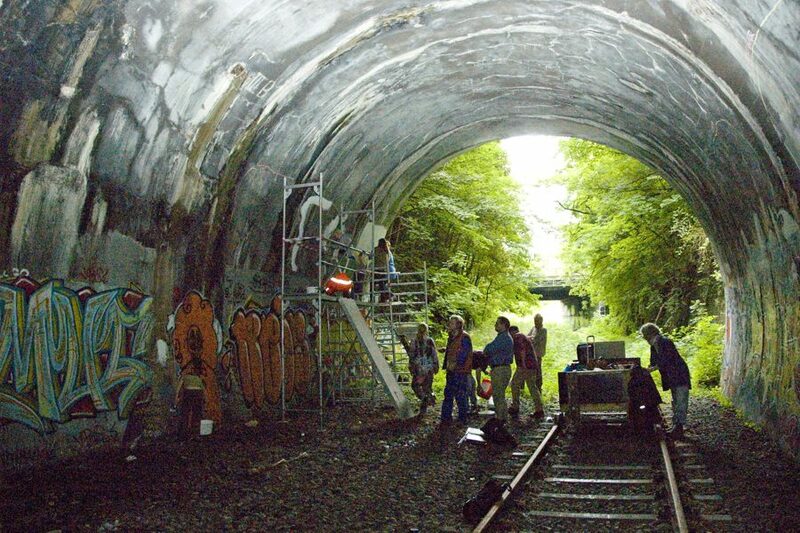 Her big projects “Tanztunnel” und “LED Lighting for the Nordbahntrasse” are parts of the past. She is still engage in and for Wuppertal. 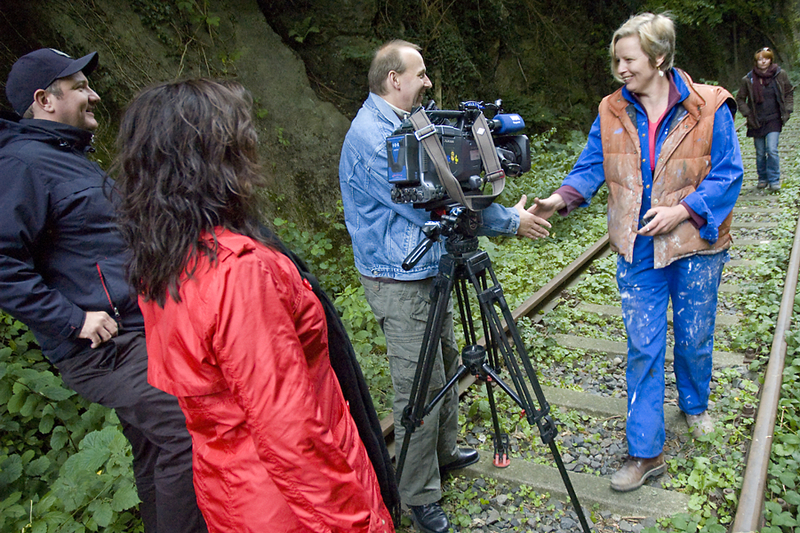 Today she is the first chairman of the “neue ufer wuppertal e.V.”. The river Wupper is changing to a part of the city. The association planing ways to the river and river restoration. They will building also a new way along the river Wupper. It will be not a competition, but a complement for the Nordbahntrasse. The paintings are from the painter and a graphic artist Sabine Bazan. 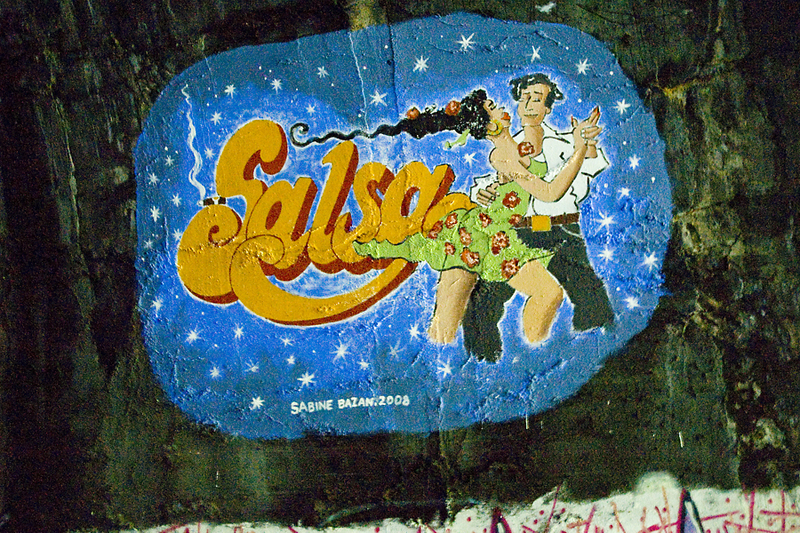 There are coming from themes like Tango, Salsa, machismo. I don’t know from other events like this in Wuppertal. She is no longer artistically active. She is committed to the art theory. 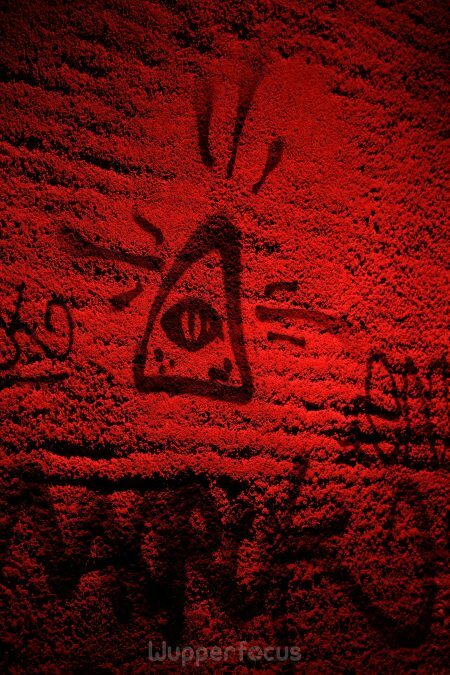 Since 2016 she studied Art and Design Science (M.A.) at the Folkwang-University in Essen(Germany). 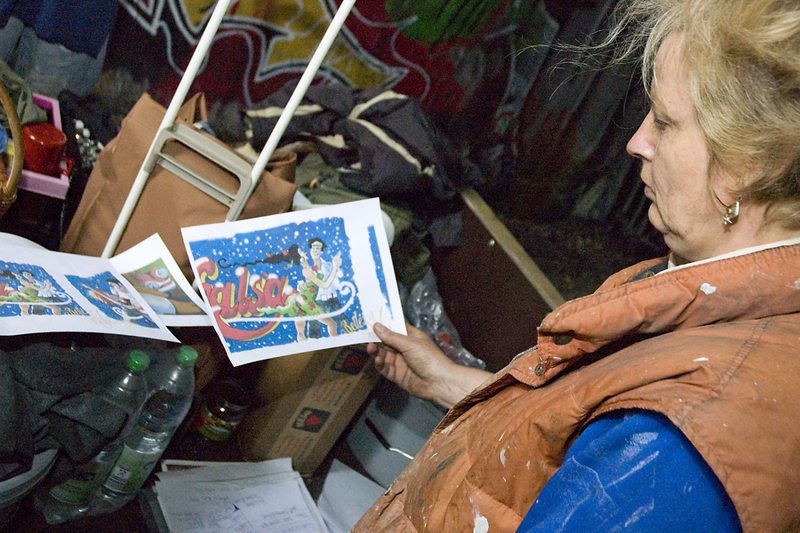 Zara Zoë Gayk gave me many photos from the working in the tunnel and the finished paintings. Thank you very much. I’m happy to show some of the photos on this website. 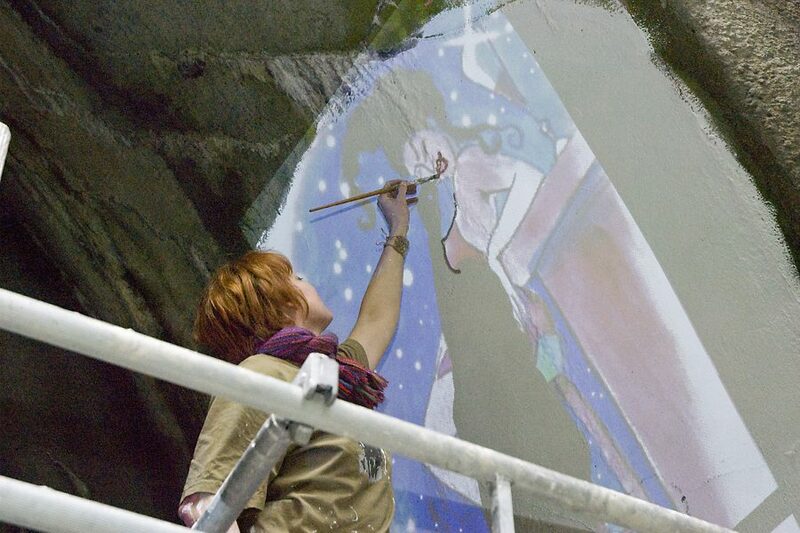 Today she work as a painter with classical and digital formats, as photographer und filmmaker. Whats your opinion about the Tanztunnel or my article about the Tanztunnel. Could you report anything about it(in english). I’m looking forward for your comment.